David Hicks France – WHAT IS JAMES WEARING? James Andrew at David Hicks France. The Telegraph’s description of me as an “updated David Hicks” has brought WIJW into contact with some amazing people – most notably with Ashley and India Hicks, and not too long ago, with Christophe d’Aboville, creative director of David Hicks France, who expressed his appreciation for what we do and graciously extended an invitation to visit him at the Hicks boutique in Paris. You may have heard me say “imagination = reality” – well here we are. 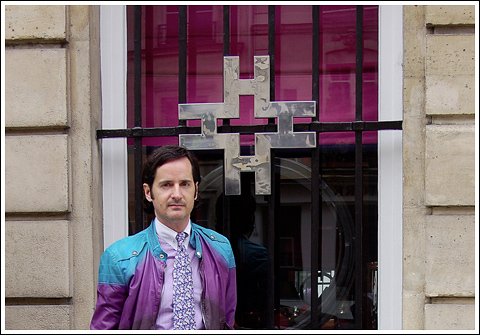 James Andrew in front of the David Hicks France boutique. The David Hicks France boutique opened in 1973 on Rue de Tourmon, just across the street from the first Yves Saint Laurent Rive Gauche boutique, providing Hicks’ already famous London brand exposure to an enthusiastic and ultra sophisticated Parisian set. Needless to say the boutique was a huge success, and continued to inspire and excite for many years. Sadly as is often the case, things do have a tendency to run their course, and by the time d’Aboville took over as creative director in the early 2000s, he tells us, the boutique had become a shadow of its former self. 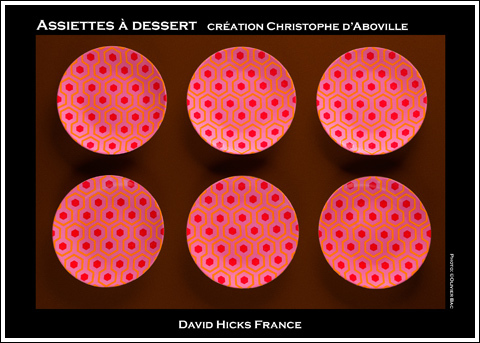 Fortunately for all of us, Hicks’ extensive archive was still intact and d’Aboville, (who has had a lifelong passion for Hicks’ work), was able to recreate with great sensitivity many of Hicks’ most brilliant designs while adding a few well placed touches of his own as well. 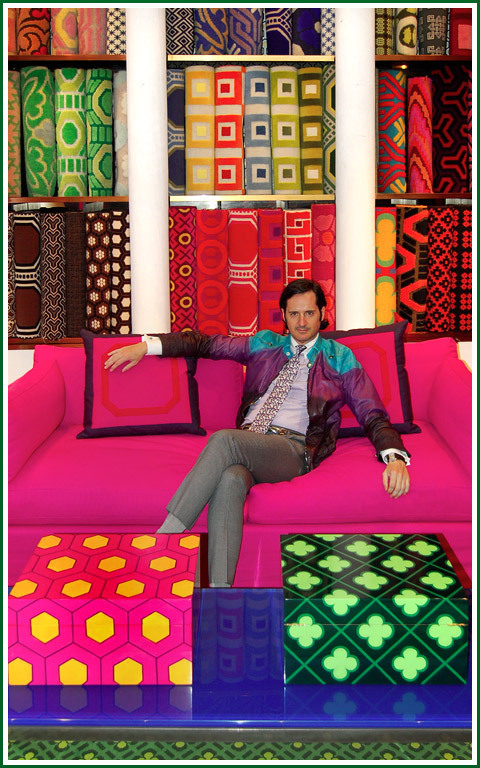 Now, through d’Aboville and owner Marie Dominique Cunaud, we are very happy to say the unbelievably rich, and wildly optimistic Hicks fabrics, carpets, furniture designs, wallpapers, and accessories are available to us once again! Being a huge Hicks fan myself it probably goes without saying that I was thrilled to have been able to spend some time with d’Aboville and to share in our mutual appreciation for the Hicks legacy. 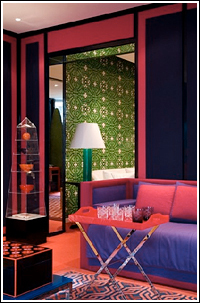 If only I could talk d’Aboville into creating a David Hicks New York! – lets start imagining…. From the David Hicks France site. In the Hicks spirit (top), I’m wearing a paper thin leather jacket in turquoise, purple and black, a pale purple and white striped cotton shirt with white contrast collar and french cuffs, both by Gucci, precious turquoise cuff links by Seaman Schepps, vintage Cartier tank watch from Raj Tolaram, floral print tie by Tom Ford, gray wool pants by Paul Smith, silver, chain link belt by Gucci, black leather “Windsor” loafers by Yves Saint Laurent and my fragrance is Creed Windsor.